Note: A new Travel Month post is coming up tonight! 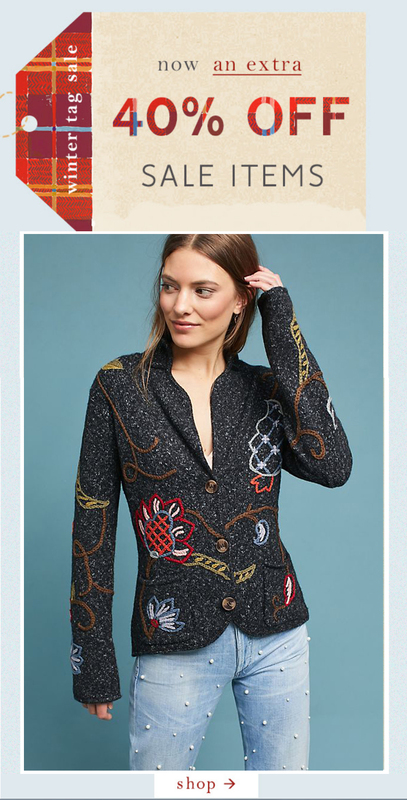 Good news, Anthropologie has added Fresh Cuts to its sale section! Even better news, I was wrong and the extra 40% off Tag Sale continues! Among the highlights in this sale go-round are the Eryn Embroidered Blazer (now $100 + 40% off, above), the Jules Collared Tank (now $50 + 40% off) and the Tama Satin Chemise (now $80 + 40% off). While you wait for tonight’s new travel month feature, be sure to check out my picks from Anthropologie’s 20% off Select Home Event, and then take a look at all the goodies Madewell has at up to 30% off. Previous Post Eye Candy: Last Day for up to 30% off your Madewell purchase!! I have a question about price adjustments. I always call on the phone for them and never get an email confirming it was done. Does that mean none of them were done? I ordered a lot of things last year and couldn't check for all of them on my credit card statement. I thought when CS tells you on the phone that the adjustment will be done that it will be done without getting an email confirmation. They should have been done if you called in — but there is always a chance that something was missed, especially during the busy holiday season. You may need to email customer service to follow up. I'm going to have to call CS for all the dates to compare them to my CC statement since there were so many adjustments. I used to order a lot from them a few years ago and never once got an email confirmation then on a price adjustment (I always called to ask for them though, never emailed). I also had a few CS reps recently tell me I would get an email confirmation and I had to tell them they were wrong, that I wouldn't get an email confirmation since I knew from the past that isn't the case. I hope most of them went through since I don't check them usually. Thanks Roxy! I never got email confirmations when i did PA over the phone, but I think every time the amount was correct. Therefore, I would say that they are pretty good with getting it done and having the adjusted amount accurately reflected. Thanks for letting me know yours are correct Nancy. When you buy a lot of sale items/popbacks that get PAs, it's hard to keep track of them. I never get email confirmations. The only time they have ever sent an email was when an item was missing from a package and they had to give me a refund. Right Anthropolitan, so I'm not sure why some phone reps seem to think email confirmations get sent out. I never get email confirmations either but they have always been spot on with the PAs. That's good to hear lulu! I recently had to request 3 separate price adjustments for online orders ( all paid via paypal) and I had to email and call more than 3x to finally receive them so I would DEF call and confirm they were completed. I knew they had not been completed because paypal sends an email when a refund is issued to my account. It took almost 3 weeks for them to finally acknowledge one. I personally would never use Paypal to pay for anything from Anthro, but now I'm concerned again. I won't be able to check all the price adjustments though, so I'll just have to forget about any money I lost (and I don't plan on buying anything else from them anytime soon, my closet is totally full probably needless to say!). I just checked other stores to see how price adjustments are handled with Paypal. Lord & Taylor only gives store credit for price adjustments that go back to Paypal. I heard stories about it taking twice as long to get money refunded and other problems like that, so that's also why I won't use Paypal for online store purchases. I also return everything I buy from Anthro online in a store and not by mail. They can't return Paypal purchases to your credit card in stores, they only give store credit or will make an even exchange. Incorrect. I have returned multiple items purchased online to anthro brick and mortar stores that were paid via paypal and the refund always goes back into my paypal account, usually within an hour. Price adjustments also go back into paypal account if that’s how I paid, it just takes longer because it needs to be approved by another department. Personally, I LIKE paying via paypal because then the funds aren’t held up, and I’m not charged either A)until it ships or B) I pick it up from a store (I often do ship to store). Oh I just checked again and when I googled it, I was reading the policy for the UK. In the UK, they only give store credit for Paypal purchases returned in store. Maybe when I ever buy something else I'll try Paypal instead. Have you ever had a cancelled item not get refunded if you didn't use Paypal to pay? Now I have another thing to be concerned about I guess. I currently have a $60 charge pending on my debit card for an item I ordered in-store last week that I cancelled on Wednesday, (because I ended up finding it in -store) waiting for it to be removed. Totally annoying. Another reason I like using paypal. I definitely prefer credit cards for when something like that happens. I have also had issues recently with being told I would get a refund for damaged items but having to call back again before the refund was actually granted. I do have a question re: returns. I have a bunch of things to return and are too much to take the store (I live in Manhattan and too much to carry!). I want to return by mail, however if I am returning more than one order in one box am I going to be charged two return label fees? With the new feature online where you "can start a return online" I am worried I would be charged more than once for returns though its shipped back in one box. If anyone has any advice, please let me know. Thank you so much! You're not supposed to be charged two return label fees. However I have been told that because of the way Anthro's PO system is set up, most of their warehouse workers cannot begin a return by mail transaction without generating the fee. Some know how to remove it I guess on multiple orders in one box but many do not. I am so with you though girl. I have some Christmas stuff to return — gifts I guessed wrong on sizing, a few doubles, etc. And the haul from Brooklyn to Manhattan with all this stuff isn't exactly easy! Ah ok thank you Roxy! Maybe I should just try and then if I am charged more than one label call customer service and ask them to refund the fee? I just don't want to pay that much to return something – if so, I'll make multiple trips to stores here. UGH, yes, the haul is not easy and I've had issues at one store in NYC which will not be named haha, where I've had a lot of problems returning things. I've found the Rockefeller location to be the easiest/most friendly place to make returns when you have a lot!